From the photo of Goodson and Gubchevsky. General view of the monument to Princess Olga, Apostle Andrew, the Enlighteners Cyril and Methodius against the backdrop of the building of the Real School. - The image is horizontal. It was built in 1911. On the pedestal of pink granite, in the center, there was a sculptural image of the princess; on the left, on the dais, stood the sculpture of the Apostle Andrew the First-Called, pointing to the "holy Kiev mountains"; on the right, on the dais - a sculpture of the sitting enlighteners of the Slavic peoples Cyril and Methodius. They made a sculptural composition from a material that was fashionable at the time - concrete. Sculptural works were directed by F. Balavensky, architect V. Rykov; the figures of Olga, Cyril and Methodius were made by I. Kavaleridze, the figure of Andrew the First-Called by P. Snitkin. In the 1920's and 1930's. the monument was dismantled. In 1995-1996 years. - restored, the figures were carved from white marble and installed on a pedestal made of pink granite . 1. Kavaleridze, Ivan Petrovich (1887-1978). 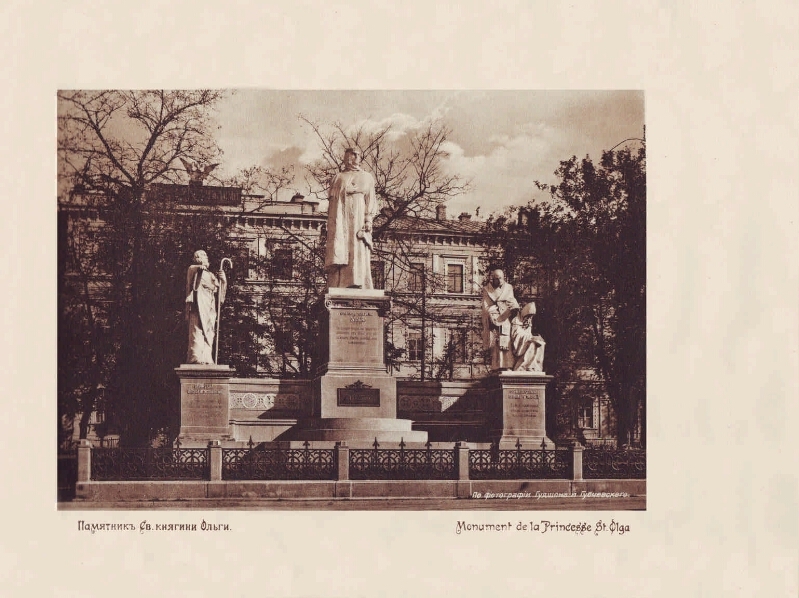 Saint Princess Olga monument - Photos. 2. Territory of Russia (collection). 3. Cyril and Methodius - Slavic enlighteners (collection). 4. Russian language (collection). 5. Landscape photos.